I said to myself: Who would want to read a story about hazelnuts? People are what folks want to read about. People are the clear winners in this battle against nature we are engaged in. Nature beings are the underdogs. Who wants to read about an understory underdog? Myself answered: To indigenous peoples plants are beings, plants are people, to be related to as one would relate to any other person, respectfully, compassionately, affectionately. So go ahead, tell this story about the intimate relationship that has developed between a human who is trying to become more indigenous to her place on earth and one of the beings in her community of relatives on the land. In the beginning, when my husband and I were removing the Chinese wisteria that was choking every tree in our woods and restoring our small bottomland forest to what could’ve/should’ve been there, we planted native trees rescued from a development. One was a hazelnut. 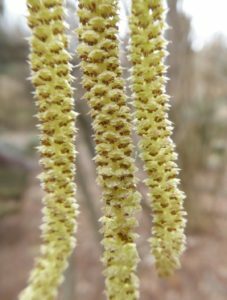 Over the years I enjoyed watching the yellow male catkins lengthen in winter and the tiny jewel-like maroon female flowers appear in February, always the very first signs of spring. I liked drawing the flowers and, in the fall, the frilly green hats around their small brown nut heads. 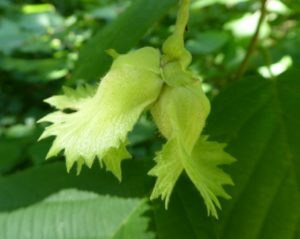 In fact, the name hazel is from the Anglo-Saxon word haet, meaning hat, referring to this cap of leafy green bracts on the nuts. 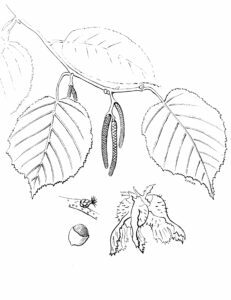 I liked their taste, too, although I knew that the hazelnuts used in coffee and chocolates were the European ones, Corylus avellana, not the ones from our eastern forests, Corylus americana, which are smaller. 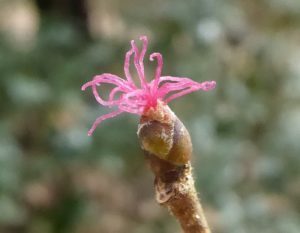 Corylus, their genus name, is from the Greek word kory, also meaning helmet or hood. Years later, when our septic system had to be replaced, threatening the hazelnut tree, I made a solemn promise to him/her (hazelnuts have their male flowers and female flowers on the same plant) that I would do my absolute best to save her from destruction, and I tied protective warning tape around him. Meanwhile I had a moving experience of communing with this hazel tree. I was studying Celtic Mysteries with a fine teacher named Mara Freeman. She read us an old Irish story about King Cormac, who is led by a member of the fairy folk carrying a Silver Bough that makes otherworldly music, to the Well of Wisdom, the source of inspiration in the center of the Otherworld. The well is surrounded by nine hazel trees into which hazelnuts drop and are eaten by a salmon who is wise because he has eaten many of these nuts. Who eats the salmon or drinks the water becomes wise. We were to make a musical wand inspired by this story. We could make it of oak or ash or apple, but I chose to make mine of hazel. In order to make this wand we were to form a ritual relationship with this wild being, our tree, by asking its permission to cut a branch, giving it something in exchange, making an offering to it, praising it with appreciations, and thanking it gratefully. Oh, here was a whole world of respectful, reciprocal relationship with nature that we have not learned in western culture and that I know so little about how to practice. In this culture, we just approach things as inert objects and take what we want. The process of cutting the bough for my wand was a profound experience. First, I walked to the edge of our woods to respectfully ask permission of the hazelnut tree to cut a branch. Hazel said she would be grateful if I honored her with a cutting, since, although I would be doing my best to save her, she might have to be sacrificed to the septic repair. In exchange I brought her some wood ashes from the fireplace and spread them around the roots to provide nutrition. Then I prepared myself to approach the tree for the cutting by doing some authentic movement and drawing in order to descend to the wild in myself. I wanted to connect to the wild energies within me in preparation for connecting to the wild energies of the tree. Therefore, when I went to cut the hazelnut branch at dusk, itself a potent, liminal time, my sense of the subtle energies within me and around me was heightened, and my heart was opened by the prospect of ritual giving and receiving. As I approached the tree I felt like I was entering a charged space, the space between us where my soul-energies and the tree’s soul-energies met and joined. I sprinkled an offering of cornmeal around the base of the tree. I praised the tree for her beautiful nuts, for his service in feeding our wildlife and our bodies, and for feeding my soul with the beautiful Irish myth of dropping its magical nuts into the Well of Wisdom to bring inspiration to those who drink from it. Cutting the branch, I felt as if I moved from ordinary space/time into non-ordinary reality and was changed by entering the transitional space between me and tree. For that brief time I experienced a sense of living in the luminous substance-filled field of nature that I so long for. I came home with the precious branch and celebrated with a cup of hazelnut tea! It turned out that Hazelnut was saved. By then she had spread and become two trees, and, in the new-found sunlight, they gave us hazelnuts for the first time in many years. I’ve finished and consecrated my hazel silver bough. After peeling the bark, sanding, and oiling the branch, I attached nine silver bells and nine little stone birds with silver wire. The chime of the bells symbolizes the singing of spirit birds on the Tree of Life in the Otherworld. Meanwhile we had started our yearly pilgrimages to Ireland where hazelnuts are an important wildlife-feeding component of the hedgerows that form field boundaries. They are quite a presence in the landscape as well as in myth. When we visited the Museum of Archeology in Dublin, I was very moved to see a bowl of 5,000 year old hazelnuts retrieved from a 3,000BC site. I felt like I was back there with those ancestors, ceremonially eating hazelnuts and making offerings of hazelnuts together. The indigenous Irish, like indigenous Native Americans, formed relationships with plant and animal species, which they held to be sacred. The Irish word for sacred tree is Bile (Bil-a). Ancient Irish Brehon Law protected trees, imposing heavy fines for their destruction, according to a four-level hierarchical classification. The highest level, the Chieftain Trees, or “Nobles of the Wood,” were oak, holly, yew, ash, Scots pine, wild apple, and hazel. Each had their special powers. The gift, the medicine of hazel, was wisdom and poetic inspiration. Whenever we saw hazel trees growing at Ireland’s holy wells, I would think of the Well of Wisdom. In another of my favorite Irish legends Fionn MacCumhaill, a very shamanic figure and Robin Hood-like cultural hero, also gains the wisdom of hazelnuts. 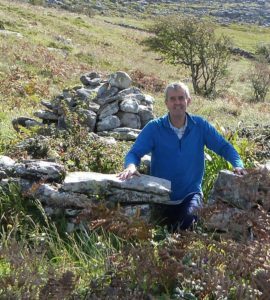 Fionn’s druidic master, Finegas, spent many years sitting at the Well of Segais trying to catch Fintan, the Salmon of Knowledge. Nine sacred hazel trees overhung this well, dropping their nuts into it, which were eaten by the salmon. 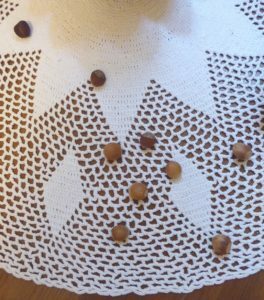 The number of spots on the salmon indicated how many hazelnuts it had eaten. The more hazelnuts it ate, the more wisdom it gained. Finally Finegas caught the salmon and gave it to Fionn to cook, warning him not to eat any of it. But when a drop of hot fish fat burnt his finger, Fionn sucked on his finger to soothe the pain. When Fionn told his master what had happened, Finegas could see that Fionn had gained the knowledge, so he let him eat the whole fish. Thus passed to Fionn the imbas, the wisdom of poetic and prophetic inspiration that enabled him to become a true poet, seer, and head of his magical band of men, the Fianna. On one of our adventures we tried to get to the Well of Segais, also reputed to be the source of the River Boyne, but we couldn’t find it. Asking at a village tavern, we were given directions, but were told that the property had just recently been bought, and they doubted that the well would ever be accessible again. Sure enough, when we arrived, there was a big red locked gate across the driveway. Must have wanted to keep all that wisdom for themselves! Hazel was used for druidic staffs, and later as staffs for pilgrims. Today it is used for walking sticks. When we went on a wonderful loop walk at Lough Avalla in the Burren, hazel sticks were thoughtfully provided to be borrowed for the hike. I was grateful, because the hike up the limestone turned out to be quite strenuous. Forked hazel twigs were also favored by diviners looking for water. One time, driving through an Irish village, we saw this sign on the industrial building of a geoengineering company: Water Divining and Well Boring. For over a year I had been looking every place I could think of in my home for a ceremonial knife that was quite important to me. One evening, I was holding my hazel wand. Thinking the hazel symbolic of finding water, I wondered if my hazel wand could help me find my lost object. I pictured that in the morning I would go all around the house with the hazel stick trying to locate it. The wand was pointing upward and my eyes followed it up to the top shelf of the bookcase that I was standing beside and there, behind some books, I found the knife, placed there, apparently, for safety from some imagined potential robbers, when we were about to embark on one of our long trips. I don’t even remember putting it there! When we went with our Irish friend and guide, Pius Murray, to visit the Oughtmama holy well in the Burren, he gave us each a hazelnut to leave as an offering at the well. This moved me because of the association of hazelnuts with the Well of Wisdom myths. Afterwards, returning from that hike at Lough Avalla, we noticed a man and woman bending over, picking up ripe hazelnuts fallen from the trees, so we picked some up to leave as offerings at other holy wells we would visit. I wanted to return home with nine hazelnuts, because of the nine hazel trees around the Otherworld well that King Cormac was taken to. But we ended the trip with only seven nuts. When we got home at the end of September I saw that there were exactly two hazelnuts left uneaten on our hazelnut trees! One day, thinking the hazelnuts symbolic of wisdom, I had an idea to ask them for an image. I shook them in my hand, as one might dice, and dropped them on a crocheted white cloth. I was astounded to see the seven light brown Irish hazelnuts form a circle around the two darker American hazelnuts. The next day I was thinking about how I needed to have more courage for my work, and I asked the hazelnuts if they might have an image to help me with this. Each hazelnut a star, they formed the constellation of Orion, the Hunter, complete with belt and sword, an image of strength. I was on a roll! At this point I had a funny thought that perhaps when a soul is about to incarnate God tosses out some hazelnuts which form the pattern of planets that make up that person’s astrology. Another day I asked, “Hazelnuts, what image will bring some peace into this inner conflict I’m experiencing today?” When the hazelnuts landed on the cloth I saw a person making great, enthusiastic strides towards his guiding star. His nut feet were well balanced. His nut-chakras all lined up. This was such a joyful image, no more inner conflict! 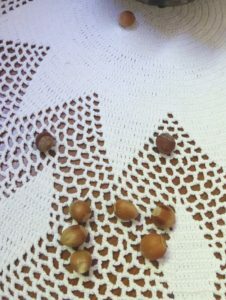 By now it was becoming clear that the hazelnuts were, for me, a form of divination. So, I began to consult them for advice. About to go on a trip to our coast to honor the wild energies of the tens of thousands of swans and snow geese that winter at the wildlife refuges, I asked hazelnuts how I could best prepare to hear what I needed to hear and see what I needed to see on this trip. They showed me what looked like a kneeling figure beginning to rise up towards a nut that was high above, a very high point, a lofty vision. It was a confirmation that this was and is a spiritual issue. The figure was both very solidly grounded in her reverence to the material earth and rising up to a spiritual vision of these sacred birds. I began to feel a strong bond forming between me and the hazelnuts, our relationship strengthening day by day. They have shown me so much wisdom and truth that I feel a sense of trust in them, affection for them, and gratitude. There is a sweet ease of intimacy between us. They come from the ancestors, their myths and legends, and they come from the land itself. They absorb the agreements of the unseen world and translate them into a picture for me, knowing I love images. It reminds me of the gentle, young Peruvian shaman who came to visit one time and told us that when he consults he reads coca leaves. They help me detect what I am sensing is missing and what is needed. 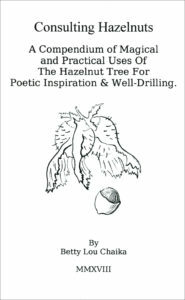 I understand that the hazelnuts take me on a visionary journey in the Otherworld energies. The hazelnuts tinkling in my hand sound a whole lot like the silver bells ringing on the hazel wand. The images that arise are always informative, and sometimes quite beautiful. On returning from that trip to the coastal refuges, I asked, “Do you have a picture for me of how to express the sacredness of these glorious migratory birds?” I saw a hazelnut person below looking up at an undulating line of hazelnut birds. The message: Keep your eye on the flights of those birds. Watch them. They will lead you. Sometimes in response to my questions, they can be gently humorous. When I asked them if they could give me an image of hope that I will gain the confidence I need to speak out for the sacredness of Earth in these dire times, they formed a very long-necked animal striding forth enthusiastically! One time after having done a purification practice with the Elements, I asked the hazelnuts for an image, please, of how I can best be centered in love. When I cast them, they formed a lovely shallow bowl, inside it a perfect circle of four hazelnut-Elements with a fifth, my heart, in the center! An affirmation of the importance of doing my spiritual practices! One day I read, “Even to this day there are country-dwellers who believe hazel-nuts to have divinatory powers, and use them in fortune-telling games at Halloween.”1 Wait, I thought I made this up! I had heard of divination being done at Samhain, but I had no idea hazelnuts were used!!! At lunch with a couple of friends I told them about my hazelnut divination. We had a good laugh when one of these friends informed us matter-of-factly that she had known for years that hazelnuts were used for divination at Samhain. Sustainable Agriculture and the Environment: Hazelnuts are drought resistant, therefore require less water, and they sequester more carbon. Since they don’t need fertilizing, growing them will reduce nitrogen pollution. They provide natural biofilters in riparian buffer zones to reduce erosion and runoff. They are a perennial, therefore sustainable crop. Wildlife habitat: Growing more hazelnuts along with other native highly nutritious species will help sustain wildlife against habitat losses. Health: Hazelnuts are very high in protein, vitamins and minerals. They contain oleic acid, the same kind of good fat that gives olive oil its cholesterol reducing properties. Sustainable Energy: Hazelnut oil for both food oil and biofuel is superior to soybean oil and, as a perennial crop, is sustainable, whereas soybeans must be replanted every year. So, hazelnuts are great for a permaculture forest garden and the popular “edible garden.” Their leaves also feed the caterpillars of our large, beautiful polyphemus and cecropia silk moths, and, according to Doug Tallamy in Bringing Nature Home3, 130 other species of butterflies and moths. Birds need these caterpillars to, in turn, feed to their babies. One morning in April, inspired, I made a little hand-crafted book of this hazelnut story. Then I got an idea to do a reading in the garden for some friends who were coming over in the afternoon. A book reading! What fun! It could be part of a Hazelnut Honoring Ceremony. I would introduce them to the hazel trees, and we would make offerings to them. Preparing for the gathering I said to the hazelnuts, “Hazelnuts, I want to share my experiences with you and show you to my friends, but I want to do this in a respectful manner. I don’t want to exploit you in any way or treat you as an exhibit. Would that be ok?” When I cast them, one nut went straight up to the lit candle in the middle of the table. Centered below this nut, the two American ones stood proudly side by side. Centered below these were three nuts in a vertical line on one side, one nut in the middle, and two in a vertical line on the other side. The arrangement was so symmetrical, such a formal pattern, it looked to me like a solemn agreement to proceed. When my friends arrived we visited the trees and made offerings to them. Then, as it was getting chilly, I suggested that the six of us sit over on the garden steps, facing the remaining sun and the two hazelnut trees for our reading. While we were assembling on the steps I had a sweet memory of how my childhood friends and I used to play a game of School by sitting on the bottom of our front steps, and if someone got the teacher’s question right they got to move up a step, a grade; the first one reaching the top won, er, graduated. I didn’t tell my friends this memory, I just smiled inside. I did tell them that I consulted with the hazelnuts about bringing them out in public, and I showed them the photo I took of their affirmative answer. I showed them the hazelnuts in the little wooden boat that they live in and read them the story. After they left, I realized with a start that, sitting on the steps, we had repeated the same pattern, as if the hazelnut reading on the table inside had set the stage for the garden reading outside! The lowering sun had shone on us from behind the two American hazels; three of the women sat in a row on one side of the steps, two on the other side, while nutter I stood in the middle. So, not only did Hazel participate with us when I asked for an answer as to how to bring this story out to these women, but she also took part in the gathering itself! Spirited Hazel actually joined us in the garden party and threw in a little game of her own! We Formed The Same Pattern! Alas, the next day I reached for the hazelnuts on the shelf, wanting to ask them a question, and discovered there were only eight of them in their little boat. Oh no! This triggered another childhood memory, this time a painful one, featuring guilt for not taking better care of something I loved and losing it. My husband, David, helped me look all around the garden steps for the missing nut. He even suggested we try using the hazel wand! We still couldn’t find it. Every once in a while, consulting them, I had wondered if or when this relationship would end, i.e., run out of steam. I didn’t think it would end this way! Sympathetic, my husband said, “Now we really will have to go back to Ireland.” But, I was bereft, feeling like I’d lost a best friend. Later, David, blessed man, handed me a roasted hazelnut he found while searching in a can of mixed nuts we happened to have. Grateful, I was about to put one of them in the boat, thinking I’d try them out together and see what happened. But, thinking better of this plan, I decided I had better ask the others first before I just made assumptions and put the roasted one in with them. I was still being hard on myself about losing one, so another couple of days went by before I asked, “Hazelnuts, can you please show me, yes or no, if this roasted hazelnut can join you, I mean join you powerfully, so we can continue our work together?” Well, one nut rolled right up and rang the silver lotus-shaped candle holder reminding me of the silver bells. Five of them formed an arrow with the other two in the lead. I understood this as yes, the roasted one can join us, because this work needs to move forward. David took one look at this throw and laughed, surprised at the clarity of the answer. Tears came to my eyes, feeling the hazelnuts’ compassion. I felt forgiven, welcomed back into the fold. I began to muse, hmmm, perhaps this very dark one, this outsider, this shadow-nut, this one who has been through the fire, might even have some special role to play in the image-making. A few days later I noticed that this dark roasted one is, for some reason, shaped like a heart. Hmmm. Nevertheless, another couple weeks passed before I gathered the courage to try them out together. Approaching hesitantly, shaking them in my hand, I said,” Hello again. It’s been awhile. I don’t detect any difference in your tinkling, except for perhaps a bit richer sound. I’ve missed you and wonder if you have something to show me.” The image they made seemed to reply, Look, see, no difference. We were nine, we are nine again, carry on. Suddenly, it was as if ordinary reality, you know, the one in which we are rather miserly to ourselves on a daily basis, opened to a vast Reality in which Compassion is the basis of existence, emanating from the smallest hazelnuts to the greatest divine beings. With moist eyes I thanked them for their wisdom and their guidance. To return from the mystical to the practical, I just read this: “If the juice of the barley kindled ‘fire in the head’ of later poets, in earlier times the brew of inspiration may have been a mead made from hazels, the tree most associated with poetry and magic in the Celtic world. Hazel mead was said to be a powerful intoxicant.”4 Well, I don’t have a recipe for hazelnut mead for you, but I will leave you with a recipe for a brew that may indeed be a powerful intoxicant: Frangelico (hazelnut liqueur, 2 oz), plus Irish whisky (2 oz), plus whipped cream, plus nutmeg. But I can’t guarantee it will give you poetic inspiration or prophetic powers! Hey, maybe we should add something bubbly to that recipe, because that just might provide the poetic / prophesying ingredient. After all, I just read, “As the berries of the sacred hazel tree dropped into the well at the center of the world they produced na bolcca immaise, bubbles of mystic inspiration [from] the fount of all wisdom.”5 Let me know if it works! Doug Tallamy, Bringing Nature Home, 2007. This quote is also from Mara Freeman’s website. What a good read for this season. Thank you for sharing your magical encounters and stories. Glad you enjoyed reading it Marsha. Yes, magic is afoot especially at this Samhain time! And magic is always right close by if we open ourselves and become alert to its presence. I’d like to remember to be alert to the presence of magic more often. So engaging, so heart-warming, so spirit-opening! Thank you, Nutter, and thank you Nuts for a sweet warmth and smile in my heart. Yep, that’s the sweet personality of the hazelnuts and the effect they’ve had on me, too. Oh, wonderful herbalist that you are, Laurie, let’s wonder together about the endless possibilities of what would emerge from forming a deeply intimate person-to-person relationship with any one of hundreds of other native plant friends. Their personalities would each be so different! Betty Lou- you say you planted a hazelnut tree from a rescue- Corylus americana I assume? How tall is it now? and it is a tree? I’m trying to remember it on your property. When I worked at an arboretum in Ohio in 1997 we had areas that were thickets of Corylus americana all about 8′ tall- large shrubs. I’ve always loved that tree/shrub. Thanks for your story. Yes, Ann, we rescued the native Corylus americana. They are, after all these years, more like 12-18′ feet tall. (Would be shorter in full sun.) We would call them shrubs or multi-trunked trees, but in the Irish stories they are always called trees. We saw, as you say, thickets of them when we were up in Wisconsin this summer. Makes me happy to hear that you love them, too. Perhaps more of your landscaping customers would like hazelnuts planted as well! Oh, thank you so much for this lovely story, Betty! Even though my Oracle is not as earth-connected as yours in form and origin, the feeling of connection and trust and appreciation is the same. Mine is the I Ching, and our connection has become very powerful , ever since i recently realized that what i wanted to do when consulting it (something i have done for decades), was ask the Spirit of Guidance to speak to me through the Oracle. How blessed we are to have these deep associations! Thank you, Azima, for your response. Yes, the feeling of closeness and trust in a transmitter that mediates between us and the unseen world, by whatever name we call it, must be something that people the world over have enjoyed. I love that you name what your Oracle connects you with “the Spirit of Guidance.” That feels so beautifully simple and true. When my son died we had a small ceremony planting a tortured hazelnut in his memory in a spot in the garden where he often appeared when I was out working with the plants. I have often said hi to him when I see it, but haven’t tried communicating with the plant. This year it sent up two sprouts from the roots. They are normal trees, not twisted, and the same height as the original tree. It is three days to Samhain, so I will talk to it then and ask for some guidance about the new sprouts. Munira, I’m sorry to hear about the loss of your son. It sounds like your garden is a special place where you can communicate with him, perhaps through the hazelnut. I wonder if the two straight sprouts are a message that he is strong and healthy in the Otherworld. Samhain is a wonderful time to talk with the plants and to your son through them. Thank you for sharing your deep process with your hazelnut. I have found Hazelnut to be so compassionate that I do not doubt that it could help with grieving, remembrance, and ongoing communication. If you’d like, let me know how this goes for you. What a well told story of love, respect and communion. It gives me such hope to see how you, a human – albeit a very enlightened one, can live so thoroughly beside and with the hazelnut. I learned many things reading. Who would have thought at salmon eat hazelnuts, or that you could use a hazelnut wand to find water or even a long-lost treasure! And for you to see those 5,000 year old hazelnuts must have been so profound as you engage with your Irish blood and this beautifully- illustrated and honored tree. Wow, just wow! Mariah, if anyone could understand “love, respect, and communion” with a tree, it would be you! I remember fondly all of your workshops in the woods at The Nature Preserve Center carried out in the very same spirit. And now you foster many artists in a community of nature-inspired creators. Thank you for your work! I finally had a chance to sit down and read this delightful account of love between a human and a plant being. And it was fun to think of the hazelnuts communicating via humor! I planted several hazelnut trees in our small backyard woodlot when the Arbor Foundation promoted them a number of years ago. Only one had survived as of this summer, and it was still less than a foot in height. So I was delighted when I saw that the NC Botanical Gardens had hazelnut trees for sale in their Garden Store a week ago! I planted two in the front yard, one in a mostly sunny location, the other in part-sun, and transplanted the one from the backyard near them. I thought they only bore fruit when there were at least two trees, but if I read your account correctly, your tree fruited when it was alone. I am hoping the trees are happy and will support each other and bear nuts for the wild critters that have fewer and fewer places to forage. Yes, Barb, the hazelnuts seem so gentle, generous, and eager to communicate – with grace and charm and sweet humor. Your planting of three (itself symbolic) will surely provide a good crop of nuts. I look forward to hearing when they bear their first nuts. We’ll celebrate! And we’ll see what wisdom they provide. Maybe they have already conveyed some wisdom to you as you have honored them by planting them so carefully, respectfully and enthusiastically! Yes, I’d love to see this grove with you, especially in February when the male catkins release their pollen to the little magenta female flowers and/or when the little nut clusters begin to form about August or when they bear nuts in September. I was happy to see them in several places along the Eno mountains-to-sea trail when we walked there in the spring. I’m really convinced they are trying to reach out to us to be nourished by them in body and soul at this dire disconnected-from-nature time we are in. BTW, botanically: You can see their small catkins forming now already. And if you look at photo of flower you will see that those are stigmatic styles (not petals). There are about 5 pairs of them in each flower. That’s why a single flower can form a cluster of up to 5 nuts! Oh, this post is so amazingly full of love and our relationship with trees that I have taken a while to respond! 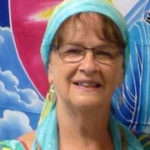 My connection with trees goes back to my childhood, my dowsing and journeying have deepened my relationships, and I can relate to your wonderful experiences. The tall trees in “our” labyrinth have their own wisdom and energies that add to this sacred space as the hazelnuts are for you. May we all continue to converse with what draws us close to hear their whispers of wisdom. Jill, I sense the wisdom of those magnificent tall trees, that sacred forest, enclosing your labyrinth sanctuary. Thank you for bringing them to me today. If I bring my hazel wand perhaps you will teach me to dowse their energies. If I bring my drum perhaps we can journey together in love to hear their whisperings.